@BarackObama wants us to wish President Barack Obama a happy birthday. 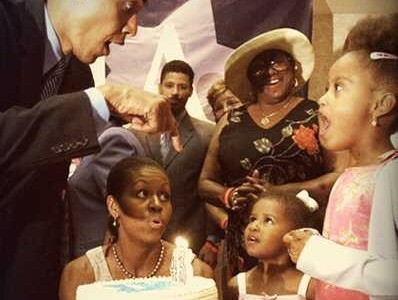 Check out the Normal Rockwellesque-style photo featuring First Lady Michelle Obama holding a giant birthday cake that obviously does not meet federal nutrition standards. How cute and sweet and lovable! But the intent of this “birthday card” is not what it seems. Michelle Obama just sent me an email asking me to sign Barack’s birthday card. Aw, we’re all BFF now! Wait, you want MONEY TOO? First Lady Michelle Obama: Sign the president’s birthday card! Buried lede: Oh, and a little money wouldn’t hurt while you’re at it. The Obama campaign has used this gambit before. In one case, it used a Mother’s Day greeting card to tout Obamacare. It’s standard operating procedure. If a candidate for public office wants to openly request contributions and e-mail addresses for its campaign database, that is perfectly unobjectionable. But using cute greeting cards as a ruse to harvest email addresses and solicit campaign donations strikes us as a bit underhanded. Whoa, whoa, whoa. Obama. I go to sign your birthday card and you ASK for MONEY. That’s not how it works. I can sign Barrack Obama’s Birthday Card… so long as I donate to his campaign. …. Yes, I did sign a birthday card 4 President Obama b/c a campaign ad convinced me to do so. Yes, I do know it is just a ploy to get my email.